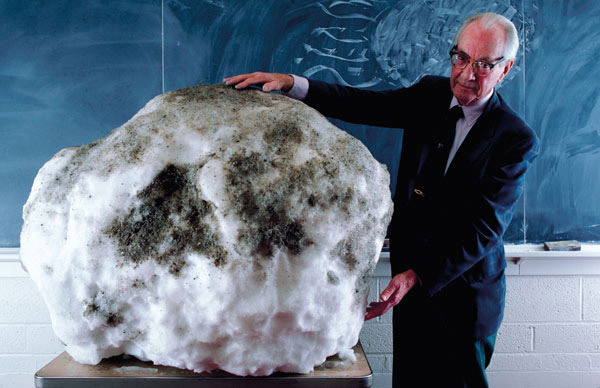 Fred Whipple was an American astronomer who, in 1950, proposed the "dirty snowball" model for comet nuclei. According to this idea, confirmed in 1986 when the Giotto probe snapped close-up pictures of Halley's Comet, comets have icy cores inside thin insulating layers of dirt; jets of material ejected as a result of solar heating give rise to orbital changes. Whipple graduated from the University of California at Los Angeles, and then helped compute the first orbit of newly-discovered Pluto while a graduate student under Armin Leuschner at the University of California at Berkeley. Whipple worked at Harvard University from 1931 to 1977, and directed the Smithsonian Astrophysical Observatory from 1955 to 1973. In the 1930s, using a new, two-station method of photography, Whipple determined meteor trajectories and found that nearly all visible meteors are made up of fragile material from comets. He also found that the Taurids meteor stream moves in the same orbit as Encke's Comet. He discovered six comets, all of which are named after him. Working for the US Air Force during World War II, Whipple came up with the idea for chaff – little bundles of shredded aluminium foil that could be dropped from US aircraft to confuse German radar. Air Force wits dubbed him the "Chief of Chaff" as a result. Later, he predicted the coming of artificial satellites and was prepared with a satellite tracking network when Sputnik was launched in 1957. The Whipple Observatory is named after him, as is the spacecraft component known as a Whipple shield.